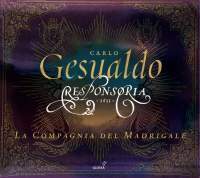 The quatercentenary of Don Carlo Gesualdo (1566–1613) closes with duplicate offerings of his last great book of sacred music (the last because there were two books of cantiones earlier), the nine responsories each day for the three days of Tenebrae, constituting Matins for the triduum of Holy Week, with the canticle and psalm that are sung toward the end of the service each day. Herreweghe, it may be emphasized, uses an adult mixed ensemble of 15 singers (19 are named because four were replaced between sessions held two months apart), while Glossa’s vocal group of six sang one voice to a part in a series of sessions spread over seven months last year. Herreweghe puts the responsories for the first two days on one long disc, the rest of the material on the other, while La Compagnia puts one day’s responsories on each disc, distributing the canticle, psalm, two motets, and six spiritual madrigals as fillers. The complete responsories have been recorded earlier by the Deller Consort (Fanfare 11:4), the choir of Montserrat (3:6), a Polish choir under Edmund Kajdasz on Veriton SXV-781/85, A Sei Voci (31:2), and the Hilliard Ensemble (14:6), two choirs of boys and men and three vocal ensembles with one voice to a part. Only the last two have been available on CD, each version on two discs. In addition, many discs have been devoted to a single day’s group of nine responsories, invariably with fillers, the outstanding example being Andrew Parrott’s Good Friday group (24:1), which was filled out with a sample of chant antiphons, psalms, and lessons at sufficient length to provide a sense of the liturgical setting. As such, it is a necessary complement to any complete set. The King’s Singers recorded the first day’s group with the canticle and psalm, adding five chants, erroneously including three lamentations; only the first nocturn called for a lamentation, with a simple lesson prescribed for the other two nocturns, so this is not as helpful as Parrott’s plan. Herreweghe’s disc layout matches precisely the longtime preferred version of these works by the Hilliard Ensemble (14:6). In an earlier recording (14:1), Herreweghe gave us the nine responsories for Holy Saturday with some fillers, using a similar group of singers. I am not convinced that this sacred music, unlike the madrigals, must be done with a small vocal ensemble, and I find Herreweghe’s performances very effective. The mannerist expression is conveyed well with three voices to a part, more comparable to the smaller ensembles than to the 40 voices from Wrocław or the slightly smaller choir at Montserrat. La Compagnia del Madrigale gave us the Madrigals, Book VI that they recorded a year earlier (Fanfare 36:6), a nice complement to this new issue. As the first disc proved, this is a highly capable ensemble with a clear grasp of the style. The intense chromaticism of Gesualdo’s music demands some relief, comparable to the need for chant Propers to give a breathing spell to the polyphony of Machaut’s Mass. Parrott demonstrated how this could be done with a mere sample of the assigned chants. By contrast, the fillers that La Compagnia del Madrigale inserts to spread the responsories over a full disc for each day provide little relief, for the style is similar, the relief lacking. Oddly, the Glossa label already knew how to offer something appropriate in Victoria’s Officium Hebdomadae Sanctae (29: 2). If there was barely a trace of chant added to Victoria’s polyphony, it was a good try, and what little they sang was more appropriate than the spiritual madrigals heard here. In reviewing the recommended Hilliard Ensemble version, I used one responsory, O vos omnes, as a touchstone for the interpretation of these works. The choir at Montserrat (3:6) sang more slowly and expressively than any other, acutely aware of the meaning of the words, fitting my notion of a liturgically suitable performance (not much agreement with my admiration for this recording has ever surfaced). The two new versions match the Hilliard’s tempo exactly, but not their delicate execution or their exquisite tuning. The Hilliard has a countertenor on top, to be sure, while Herreweghe produces a fuller sound with the tonal quality of mixed voices. La Compagnia del Madrigale is more forceful, as in a concert performance, though they shade their dynamics well. A Sei Voci, a little faster, is almost a match for the Hilliard. The Polish choir, not quite as slow as Montserrat, produces a thick choral sound and gets dull engineering to match, not recommended on any count. I find that the choice comes down to format. Hilliard and Herreweghe fit on two discs. La Compagnia del Madrigale is at a disadvantage, being spread over three discs with the unsuitable fillers. Their performances are not superior to the others to a degree that overcomes that disadvantage. The choice between Hilliard and Herreweghe comes down to the number of voices and their tonal quality. Herreweghe’s new version on his own label Φ (which can be rendered as PHI) is an acceptable alternative to the classic Hilliard version.